Please note, many Apple Records issues also carry an EMI logo. This is not a label and EMI should not be added as a label, it instead indicates that Apple was part of the EMI Group. 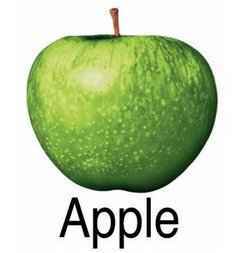 Apple Corps Ltd. the company owned by the The Beatles launched its record label division early in 1968. Through a complicated series of deals, the Beatles licensed its records from EMI, which then handled distribution on Apple's behalf. This arrangement has, more or less, continued to the present. Between 1968 and 1974, Apple released some 40 albums by other acts, the most successful being Badfinger. However, since then it existed solely to administer the Beatles' catalogue (group and solo) released between 1962 and 1976. The label was, for three and a half decades, run by Neil Aspinall on behalf of the four Beatles and their heirs, but he retired in 2007 to be replaced by Jeff Jones. In 2009, after decades of wrangling, the company reached an agreement to license the Apple trademark (not the logo) from Apple Inc. the world-famous computer and electronics company. In 2010, a massive remastering campaign of the label’s entire catalogue began.